The back roll is directly connected to the out-put shaft of the reduction gear through the universal coupling. Mill body, reduction gear, emergency brake and induction motor are installed on a common bed, so the complete set of the mill is installed on a level cement without any foundation bolts. Squirrel Cage rotor, drip-proof, with magnet star-delta starter. Heavy duty graded cast iron machined and provide with High Lead Bronze Bush, Oil lubricated by pump. The rear blocks are to be fixed in position. The front blocks are adjustable for the setting of roll nip. Safety blocks are to be provided for overload protection. Mild steel welded construction and annealed, stress relieved and machined to accommodate roll bearing blocks, frame caps and adjusting gear. The frames shall be furnished with machined pads for mill accessories. The frame caps are machined for fixing onto the side frames. Tops of caps should be provided with a finished surface for mounting mill accessories. Manual ratchet lever, with nip indicator. The guide plate should be of two-piece design. The front roll guide plates are arranged to slide with the opening of the roll nip. 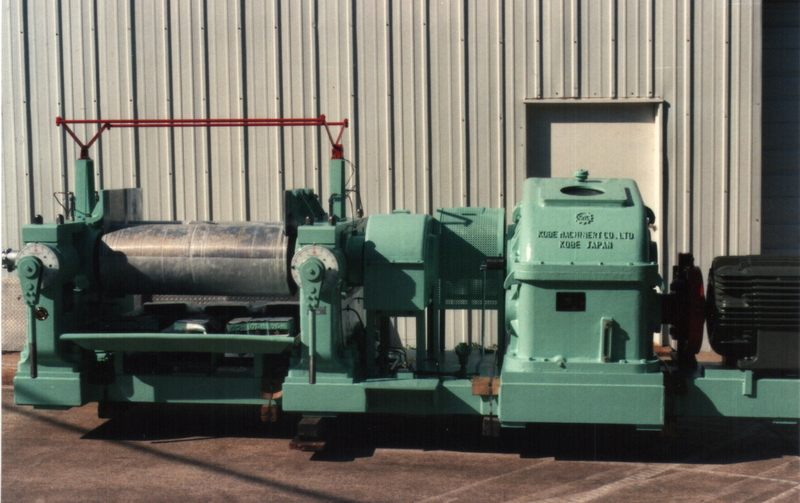 Bell mouth type, with piping and water receiver or rotary joints. Magnetic circuit breaker, band brake type, with lever switch. The machine will be able to come to a complete standstill within ¼ revolutions after applying the brakes. Riser blocks to raise mill to OSHA required height. Protective body bars front & rear. Fabricated steel plate and to the directly under the mill proper. Cast iron or welded construction, 2 halves type. Single helical, hardened and heat-treated.